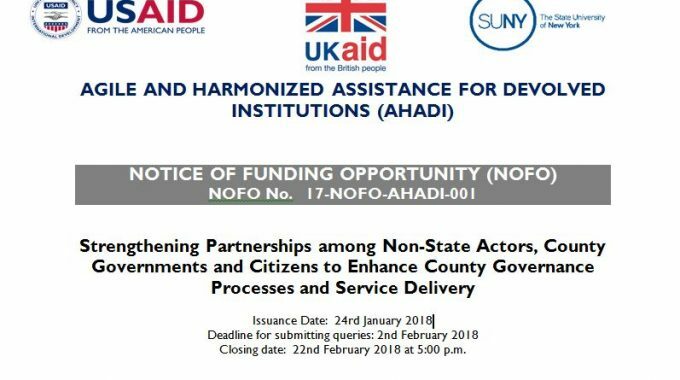 The Agile and Harmonized Assistance for Devolved Institutions (AHADI) Program is a governance program funded by the United States Agency for International Development (USAID) and the UK Department for International Development (DFID). The program is implemented by the Research Foundation the State University of New York/Center for International Development (SUNY/CID) in Kenya, is seeking concept papers for the implementation of initiatives designed to strengthen partnerships of the non-state actors (NSAs), citizens and their organizations, and county governments to enhance citizen engagement in the county governance process. AHADI is seeking proposals from qualified and experienced NSAs in Kenya to pilot innovative, cost-effective and sustainable citizen participation approaches in the program’s target 22 counties listed below. The grants will support proposals by NSAs that aim to strengthen citizen engagement in county governance and service delivery. This funding opportunity is to promote meaningful participation in any of the various steps of the county public expenditure management (PEM) cycle, which range from policy and legislative development, planning, and budgeting to implementation of activities for service delivery, monitoring and evaluation, performance management and oversight. AHADI seeks to award grants to be implemented over a period of six months. The proposals may address/cover one or more of the five components above and should cover one or more of the 22 AHADI target counties. AHADI will award a maximum of USD 250,000 per organization; a grant might cover more than one county or component. While the allocation by component in the table above is indicative, the aggregate award to all partners shall not exceed the total funding available. Organizations are encouraged to provide cross-component and cross-county proposals. Note: Proposals outlining activities in a realistic implementation plan indicating accelerated and rapid response will be given extra evaluation points. Consortia may apply, provided they are either already legally established consortia, or that the organizations wishing to work as a consortium for this NOFO sign and submit with their proposal a clear consortium agreement. A single award would be made to the lead member of the consortium; all members must sign the grant agreement and comply with all grant rules and regulations. Sub awards to consortia members, either by the lead member of the consortia or by AHADI, are not allowed. Must have competence in the intervention areas which should be clearly demonstrated in the application. 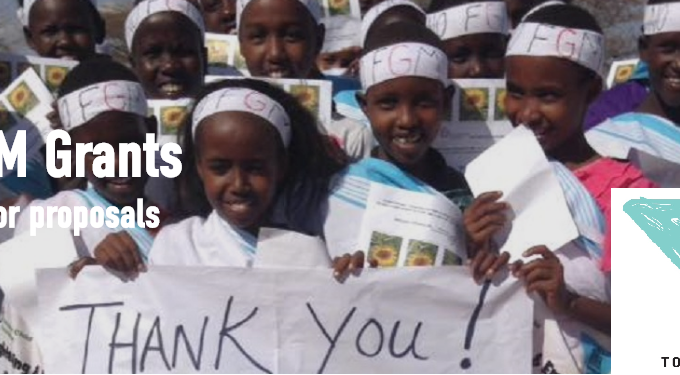 Demonstrate proven track record of designing activities and interventions that target and empower the marginalized groups to engage governments and decision makers effectively. Given AHADI’s call for collaborative engagement, applicants are encouraged to engage in a dialogue and partnership with county governments during the process of developing proposals for this NOFO and where possible show proof of collaboration. Must have good track record on managing and accounting for donor funds. Applicants must clearly identify and state the target county or counties where they will work, specify the focus of their initiatives and the number and types of beneficiaries their proposed initiative(s) will serve. Applications should also highlight the approaches they propose to use if they are successful. Lodwar Town for Turkana County on 2nd February 2018. Please note that AHADI will convene sessions in the listed areas/regions depending on the number and nature of the requests received. The sessions will be held from 10:00 A.M. until 12:00 P.M. and exact venue will be communicated to those who shall register for the sessions. The venues and dates may be revised depending on the interest and confirmations received by AHADI. These sessions will allow eligible and interested applicants opportunity to ask questions about the NOFO and receive the relevant guidance from AHADI. Those who would like to attend the sessions are advised to confirm attendance by sending the participant’s’ and organization’s name to Shem Juma at NOFO@ahadi-devolution.org no later than 4 days before the date of the forum of their interest. Only one person may attend from each organization. Participants who wish to attend are further advised that AHADI will not meet their costs for travel or accommodation. Annex C – Information on AHADI support to county PEM processes.